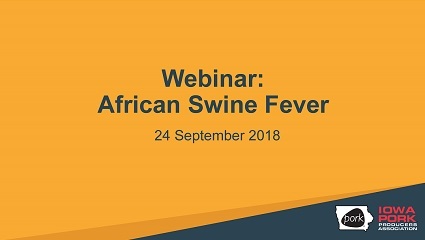 September 24, 2018 – IPPA hosted a webinar about the status of ASF in China, actions underway by the pork industry and State of Iowa, and practical on-farm preparedness tips. Speakers who were part of the webinar are Dr. Patrick Webb, National Pork Board; Dr. Chris Rademacher, Iowa State University Extension; Dr. Liz Wagstrom, National Pork Producers Council; Dr. David Schmitt and Dr. Jeff Kaisand, Iowa Department of Agriculture and Land Stewardship; and Jamee Eggers, IPPA. The video is approximately 55 minutes long.